Thanks to the half term holiday last month I read another book! This time a full novel. I read the amazing I Let You Go by Claire Mackintosh. Its a real thriller and keeps you on the edge of your seat right until the end of the book. It wasn't until I saw people staring at me that I realised I read the last few chapters with my hand over my mouth! I am still listening to Gone Girl by Gillian Flynn but I am enjoying it. I tend to grab a few minutes in the morning to listed while I am getting ready. I managed a huge chunk on Saturday which was lovely. Instead of watching TV when I found myself child free I did some crafting and listened. It was bliss. This month I reading another bloggers book! Its becoming a bit of a theme but they are really brilliant authors. 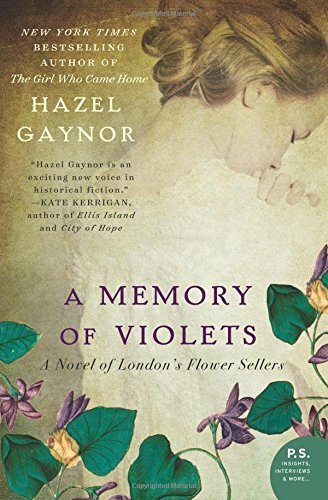 Its called A Memory of Violets by Hazel Gaynor and it is a story about Victorian flower sellers. Her first novel The Girl That Came Home is about the Titanic and is absolutely brilliant.